Michel Quenot, in his book, The Icon: Window on the Kingdom, wrote that an Orthodox icon is “theology in imagery,” expressing “through colors what the Gospel proclaims in words.” Icons proclaim the Incarnation—that our Lord Jesus Christ became fully human to save us and thus can be depicted. They remind us that we are “surrounded by a great cloud of witnesses” of holy men and women that have gone on before us (Hebrews 12:1). In loving memory of Charles “Chuck” Beechan, a replacement veneration icon of Christ has been commissioned. 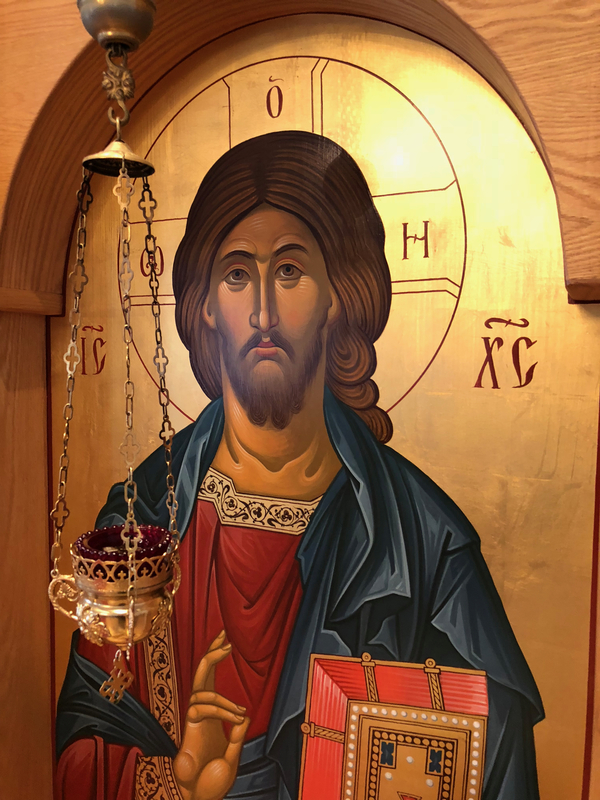 It will be placed on the stand (analogion) in front of the existing icon of Christ on the iconostasis (pictured right), complementing it. It will be completed by Dmitry Shkolnik, who painted the icons of the iconstasis. Christ Pantocrator is one of the most common images in Orthodox iconography. “Pantocrator” is the Greek translation of the Hebrew title El Shaddai, meaning “all powerful.” Looser translations are “Ruler of all” or “Sustainer of all.” This attribution to Jesus was important given the Christological controversies that tore the early church. The Christ Pantocrator icons were symbols of the Nicene verdict that Christ was co-equal and co-eternal with God. Earliest known Christ Pantocrator icon are dated around the Sixth or Seventh Century.